Kreplach are small dumplings filled with ground meat, mashed potatoes or another filling, usually boiled and served in chicken soup. They are similar to Italian tortellini and Chinese wontons. 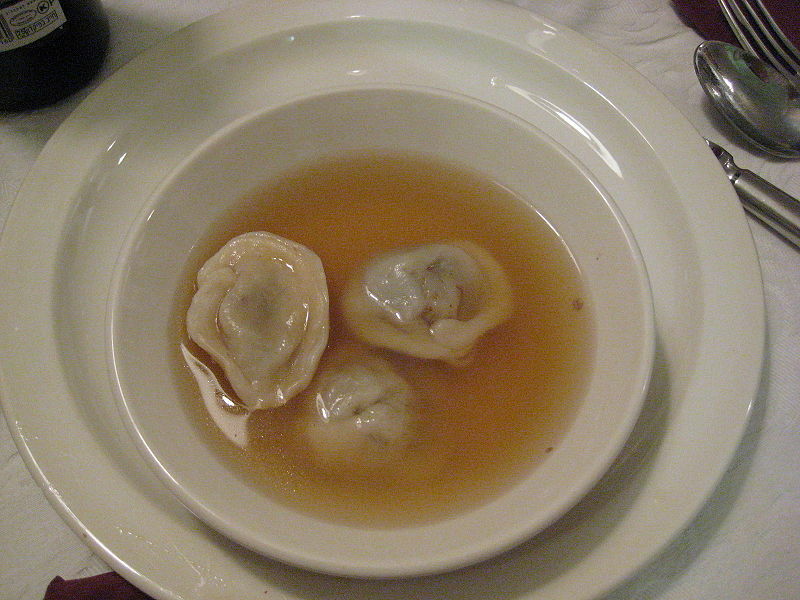 Left: Meat-filled kreplach in a clear chicken soup. In many Ashkenazi homes, kreplach are served on Rosh Hashanah, at the pre-fast meal before Yom Kippur, and on Hoshana Raba. Kreplach with vegetarian or dairy fillings are also eaten on Purim, presumably because of their triangular shape akin to the traditional Purim hamentaschen. A variety with a sweet cheese filling is served as a starter or main dish in dairy meals, specifically on Shavuot. Stuffed pasta may have migrated from Venice to the Ashkenazi Jews in Germany during the 14th century.